Giant-Size Marvel: Astonishing Tales 25 and the Birth of Deathlok, with insights from Rich Buckler! Astonishing Tales 25 and the Birth of Deathlok, with insights from Rich Buckler! UPDATE: I originally wrote this article on Deathlok back in February 2011. At the time I wrote it I was using information in FOOM Magazine #5 and the back pages of Astonishing Tales #25. I made some unintentional errors which were cleared by Rich Buckler, after I met him on Facebook. I am republishing this article along with comments made by Rich in our email correspondence in November 2014. The cover blurb at the bottom of Astonishing Tales #25 called Deathlok: Perhaps the greatest creation yet in the Marvel Age of Comics, Phase Two! You could call Phase Two the entire era under the editorship of Roy Thomas, the 70s period that saw the rise of creators like Steve Englehart, Don McGregor, Doug Moench, Steve Gerber, etc. A period of wild creativity and doing new things with the toys that Stan Lee, Jack Kirby, and Steve Ditko had left behind. But there were also brand new characters during this period, and one of the most different and daring creations came from Rich Buckler. "Doug Moench is not the co-creator of Deathlok. If he were then he would have been listed on the credits as such of the very first story page of Deathlok's debut in Astonishing Tales #25. That is because when Roy Thomas introduced me to Doug, I came to Doug with the concept--not the other way around. Also, importantly, my work for Marvel on Deathlok was contractual." When I think of pop culture in the 1970s, the term anti-hero comes to mind. In comics, movies, and novels. Marvel was more prone to anti-heroes, since the writers and artists were more in tune with the counter culture. Deathlok was a prime example of an anti-hero: in the first few pages he kills a few guys quite brutally. At the same time he’s fighting against The Man, General Ryker and his military industrial complex—from a future set in the 1990s (that seemed so far off then). You didn’t have to explain back then why anything connected to the military was bad, it just was evil by inherent nature, you dig it? For the guys who read this first issue of the newsstand like I did, you will remember that The Six Million Dollar Man was on TV. But this wasn’t a cheap rip off of ABC’s Cyborg. 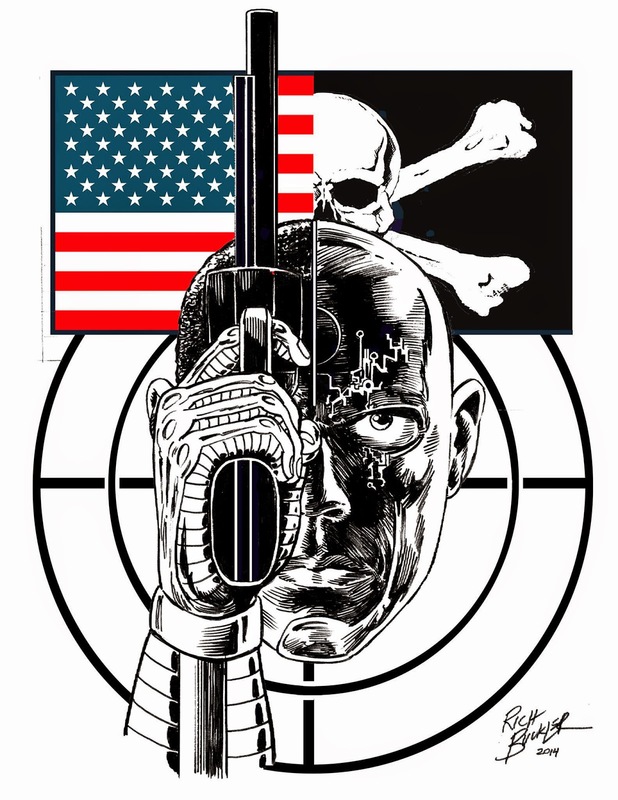 Rich's original name for the character was DEADLOCK (as in a man locked in death), which was at a later stage refined to DEATHLOK as suggested by Doug Moench. In the first issue we discover that Colonel Luther Manning, described by Ryker as one of the most brilliant battlefield strategists alive, was killed on the battlefield. Half of Manning’s face and his entire right arm were blown off by a concussion bomb. Ryker’s scientists have kept Manning’s brain alive, and they rebuild his body with cybernetic parts, making him better, stronger, faster, and more lethal than anyone in the future! Deathlok was Rich Buckler’s idea—he created the visual of the character and initially envisioned it as a novel. My favorite thing about this character is that he shares his brain with a computer, who constantly challenges his decisions. This sequence from page 2 of Astonishing Tales #25 is truly remarkable. It is very cinematic, drawn by Buckler as if he is a movie director, with the sequence of the victim running away—every movement tracked by Deathlok’s computer. The second is that there are three levels of narration in the captions: Deathlok’s computer voice, Manning’s voice, and an omniscient narrator that was written in a sort of stream of consciousness style. The "omniscient narrator" was dropped in later issues to clarify the storytelling. "That story page with the victim/target running away from Deathlok--that was one of the first fully drawn pages submitted to Roy Thomas as samples. It was written and drawn by me (with Doug contributing embellishments in the final script), and the actual page was included and printed as part of the finished product. Doug followed my story notes which were penciled in on the borders of the art pages." I think Deathlok is truly remarkable as a unique character, both visually and narratively. Marvel has tried to reboot the character many times, but to me each attempt has always failed, because they lost the internal conflict of Manning versus Computer. Who wants to have their decisions ruled by a computer telling them what to at every step of the way? Deathlok’s computer threatens to override his functionality and shut him down entirely. Manning is constantly fighting against it. I ain’t nobody’s bloody machine! Manning screams in the second issue. --and ain’t no more orders gonna be plugged into my arm—or my brain! 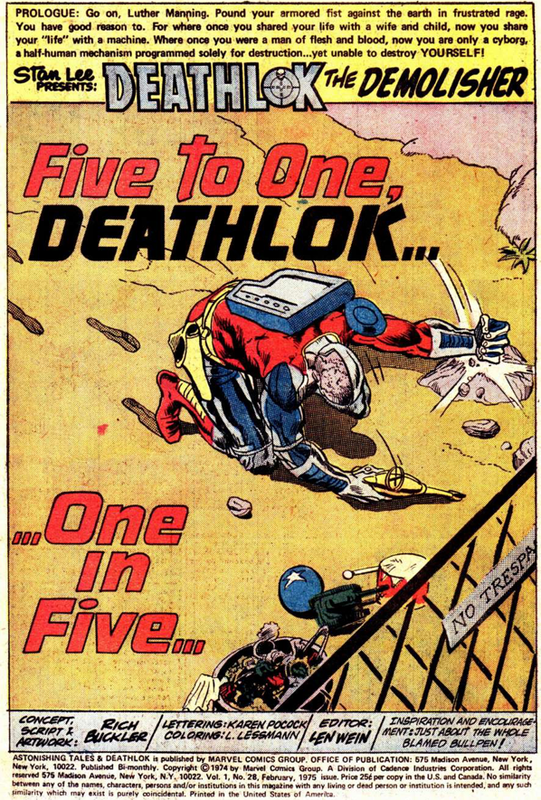 The other remarkable thing about Deathlok’s first appearance was the promotional push that it received. Back then we didn’t have Previews or web sites or any type of magazine telling us what was coming. F.O.O.M. (Friends of Old Marvel) subscribers who received FOOM #5 in 1974 read this short article by Doug Moench: Buckler & Me & Deathlok Makes Three. His first meeting with Buckler and discussing the artist’s ideas for the character over deli sandwiches in New York City. How many kids dreamed of working for Marvel after reading that, hanging out with Moench, Gerber, Thomas, and throwing around ideas for Marvel Comics? I know I did. To whet the appetite for this character, FOOM #5 also had this diagram schematic of Deathlok’s costume and gear. All of which looked ultra cool to me. Hmm, I wonder if Eliot R. Brown saw this diagram and that was the birth of his interest in doing this kind of stuff for Marvel Universe Handbooks? UPDATE 2014: Not only is it clear that Deathlok was Rich Buckler's creation, he had a very unique deal at Marvel in 1974. "All of the designs, character names, story titles and original concepts in the original Deathlok series were mine. I even designed the book's logo. I did originally own a 'piece' of the intellectual property. Fifty percent, actually, of all merchandizing, licensing and novelization rights. I lost out on that subsequently in an out of court battle." Maybe you were not an exclusive FOOM club member. Well, you couldn’t have missed this promo column announcing Deathlok in the Bullpen Bulletins page for August 1974. I just love everything about this column, how Marvel trumpeted their comics and creators to the world. We’re shifting into high gear, troops—but we’re not going anyplace without you! Back to Astonishing Tales #25. The first story ended a bit abruptly, but there were some extra pages of content. There was a two page discussion between Roy Thomas, Rich Buckler, and Doug Moench over the creation of Deathlok. Buckler mentions again how he would like to eventually write a novel about Deathlok. Looking back at the whole launch of Deathlok, Marvel gave it a really good promotional push. He had a two year run in Astonishing Tales, which ended with issue #36, with Buckler staying on until the end. Moench left after the second issue, Astonshing Tales #26, and Buckler took on writing duties as well as the artistic ones. "After the first two or three issues I did not let up on the experimental storytelling and bold treatment of unexplored conceptual territory. There were many conceptual and graphic firsts throughout that run in Astonishing Tales. And back then I was editing, writing and drawing all of that while struggling to keep up with penciling a monthly title and a handful of covers for Marvel at the same time. So, of course, there were deadline problems now and then--and sometimes creative control was wrested from me (particularly during one short period where I moved back to Detroit and in New York Marvel was switching Editor-In-Chiefs). Sometimes the writers I worked with would veer off or not understand and communicate the story material clearly. I took over the writing reigns completely whenever I could. It was a crazy time, and nobody at Marvel had a creator deal like mine (and I think, no one ever will after that!)." Indeed there are many strong visual storytelling elements in later issues of Astonishing Tales! Here are a few of them. 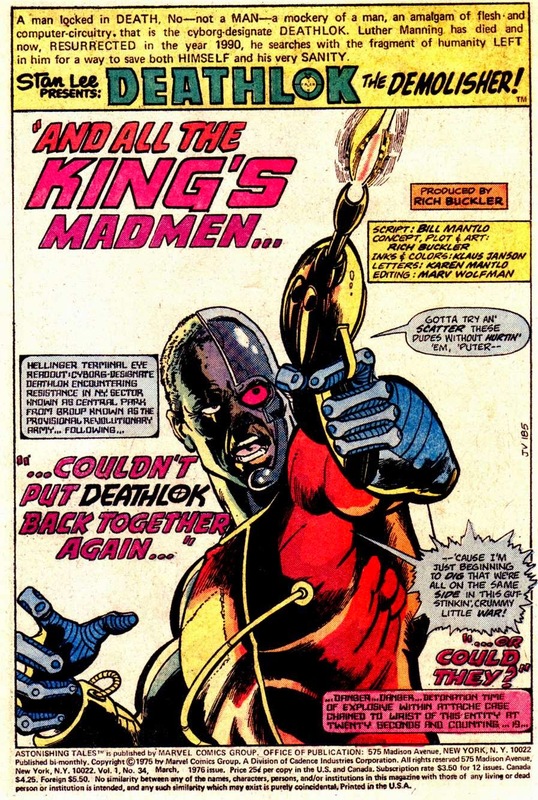 I think Deathlok (along with Killraven) is one of the most unique characters created during the 70s. I wish Buckler still owned a piece of it. He doesn’t even get a “created by” credit on any new appearances in Marvel Comics, which seems quite disgusting. There is something at the core of the character, a potential for untapped stories that Marvel has failed to realize despite many reboots. I suspect Deathlok has influences beyond comics; when I saw the 1987 film Robocop, it seemed to me that character was similar to Deathlok in many ways. Nuff Said! Update 2009: Giant-Size fan Toby sent me this scan, for Rich Buckler's variant cover to the 2009 Deathlok #1 mini-series! Hated this series entirely, but it is good to see that Marvel commissioned Buckler for this gem, a re-take on the classic Astonishing Tales #25 cover. Update 2014: Rich Buckler did a variant cover for the new Deathlok series coming out from Marvel. How many Deathlok reboots have there been now? Please follow Rich Buckler on Facebook! You can see lots of original artwork there and find lots of information about his work. Thanks for writing, Rich! Nuff Said. Thanks for a Deathlok feature. Brings back memories! He's one character which never really reached his maximum potential...unfortunately. maybe someday if Moench and Buckler reunite. Oh yeah the Killraven post was great too! Man, I LOVE this issue of amazing adventures! Probably my favorite single comic of all time. Great post on this truly unique Bronze Age Masterpiece. Great blog too, btw! Thanks for sharing! Another one of the comics that I could never bear to be parted with and still have a smattering of. The revisions of this character that Marvel have done over the years are pretty much awful, I really wish they would let the original creators have a go at it again. It is a true 70's creation, as you said; downbeat, dystopian and distrustful of "the man". It is still great. I reread the whole lot again recently and it stands up just as well as that other great 70's sf Marvel comic, Killraven. Time for a collection, please, Marvel. Thanks for the cool review on Deathlok. We must be the same age or something, because that's EXACTLY the same thoughts i had of it. It was a great, original concept. Yes, someone involved in robocop read it, no doubt. I also agree that after the first couple of issues, it got "lost." too bad. He's one character which never really reached his maximum potential...unfortunately. maybe someday if Moench and Buckler reunite and that after stuff really didn't help give him maximum potential.Deathlok's arguements with computer,gave ideas for my Toreus character. IF i got away with a Defenders revival, I would so take them to meet Deathlok during this original time!!! Deadlock was an ok comic,but allot of it was muddled by a confusing first issue and allot of mindless writingwriting later on.And those other Deathloks have not improved the story much.Don't give to shits about Michaer Collins and the rest.Marvel needs to redo the Luthor Manning version.